Yeah almost pulled the trigger on that one again. I didn't understand what's happening on my screen, fortunately, I don't suffer from arachnophobia. 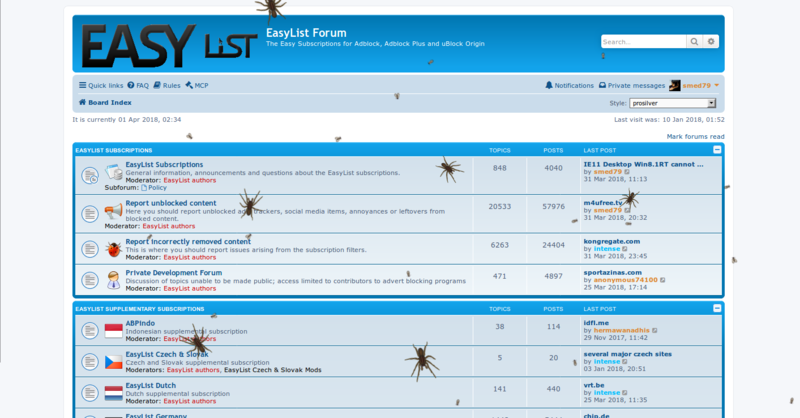 Yes some creepy crawlers are running rampid all over the site. I keep pointing to them and all they do is fall down. Something's definitely up. This reminds me "Crimsonland", a game that i was playing in the past https://www.youtube.com/watch?v=f9DHOjtD3wo. Interesting to note that April Fools Day originated when the current Gregorian calendar was adopted by Christians in the 16th century and it regarded January 1st as the New Year. Traditionally a New Year began in April and those who didn't adopt the new calendar were mocked as April Fools. I wonder what it would be like if the New Year began in April even now. Summer in the beginning of the year... Nah I like it in the middle.